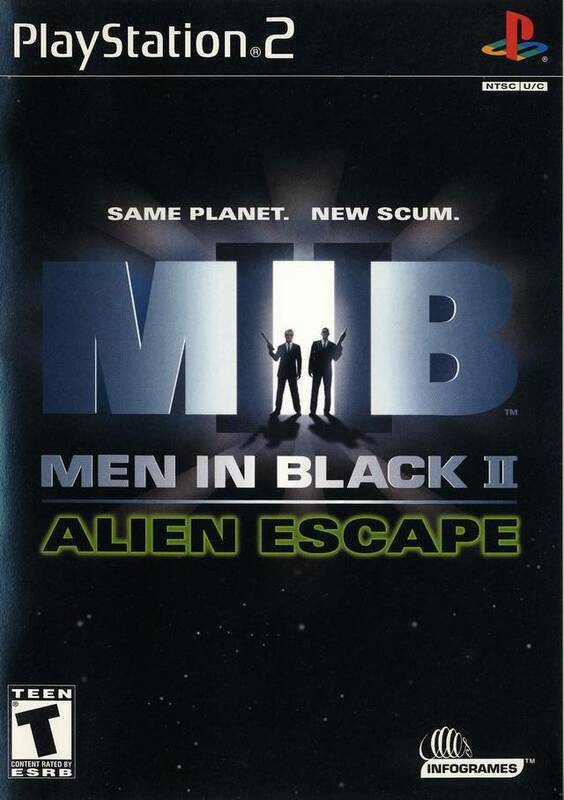 After years of games based on the Men in Black animated series, North American console exclusive gamers finally got their first ever Men in Black film universe game with the release of 2002’s Men in Black II: Alien Escape that released on both the PlayStation 2 and Nintendo GameCube. Hailing from a different developer from the team that put together the last MIB console game, Men in Black: The Series – Crashdown, for the original PlayStation, Alien Escape continues the trend of trying to marry the franchise with the shooting genre, this time trading in the FPS corridor theme from Crashdown and instead taking an third-person perspective with an almost 8-16 bit arcade approach. With perhaps a little more polish and time Alien Escape could have maybe become a lost classic for those who love games like Contra, but instead its claustrophobic, uninteresting level design and repetitive gameplay keep it at being merely okay and a curiosity for those who wondered what Contra truly would have best been like had it been better approached in 3-D.
James “Milkman” Mielke it seems was a huge Alien Escape fan back in the day going by his score in EGM. Similar to how X2: Wolverine’s Revenge was a film tie-in by name and cover art only, so too is Men in Black II: Alien Escape. It has nothing to really do with the film that was released in 2002 nor is it a sequel to anything, making the “II” in the title rather confusing as well, though with a little tinkering this release could easily have become a sequel to Crashdown. When an alien prison ship veers off course causing its prisoners to be released, it’s up to Agent’s J and K from the Men in Black organization to put them back in their cages by any means necessary. Besides the fact that this has little to nothing to do with the film in which this game ties into, the story is fairly inconsequential to Alien Escape as well. It’s a decent setup for the premise of the game, but not the driving force for you to keep playing. The characters of both J and K don’t even look nor sound anything alike their film counterparts, with K being the worst offender as he both looks and sounds like an Elvis Priestly impersonator and little like Tommy Lee Jones. Konami’s Contra franchise was rebooted on the PS2 with the excellent Contra: Shattered Soldier that paid respects to series 2-D roots and was followed by another attempt to transition the series to 3-D in 2004’s Neo Contra. You might wonder “what does this have to do with a Men in Black game?” and the simple answer is well, everything. Men in Black II: Alien Escape owes a lot to Contra in its design as is probably a better representation of that franchise in 3-D than anything Konami has produced. It doesn’t feature one hit kills or tricky plat-forming, but what it does has is a ton of aliens that need to be put in their place with large caliber weapons and for those looking for that specific type of arcade-y shooting action, it does that style of combat very, very well. Alien Escape is a pretty simple game but one that’s also mechanically sound and secure in what it is. As either Agent’s J or K, you travel through five stages, each with three or four sub-stages that culminates in a boss fight at the last stop. 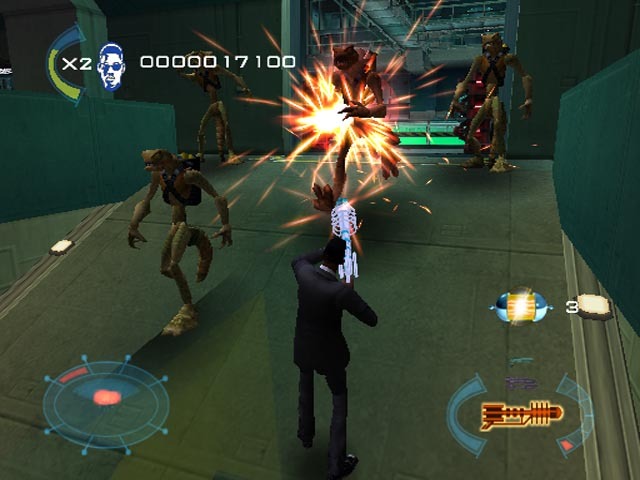 Those who have grown up with twin-stick shooters may have a bit of learning curve when picking up the controller to play Men in Black II, but after a few minutes the controls start to click and everything becomes natural. You primarily move around the environments by strafing using the shoulder buttons to avoid enemy fire while you return yours in kind. Also in your repertoire is the ability to dodge roll and quickly turn 180 degrees to quickly attack enemies that sneak up behind you. These are all skills that have to become second as enemies are coming at you from all sides and the pace rarely lets up, even when you clear out a screen more aliens are already spawning to attack you. There’s no second stick aiming, just a generous lock-on that was a smart decision from developer Melbourne House, as it makes things simple and easy to pick up like the games this one clearly takes inspiration from. The way your character’s arsenal is handled in Alien Escape is similar to Contra: Shattered Soldier wherein you have access to three weapons that you can cycle through that are best used against certain enemies. This game nixes the one hit death’s found in Konami’s classic series, but manages to implement the mechanic in a way that makes getting hit just as painful. Destroyed enemies will sometimes drop power-ups that level up each of your three weapons, each designated by a color like blue, green, orange, etc., making it more powerful. Getting hit however causes you to lose one level but it also gives you a brief window to recover the power-up item, throwing in a risk/reward situation where you have to decide on the fly if getting more weapon damage back is worth the health it may cost you. That decision is not to be taken lightly as Men in Black II: Alien Escape can be a pretty tough game. For each of the five worlds you get three lives to make it through each of their levels and a boss with no way to get more either from an item or be racking up a high score. The levels themselves aren’t terribly long, ranging anywhere from ten-to-fifteen minutes to get through, but if you use up all your lives save one, get to the boss and are unable to beat them, the only option you have is to often restart an entire world sometimes. This game does have continues, however you continue within the same stage and only with the health and lives you had entering it, so if you were counting on continuing with full lives and health, think again. You can save your progress, however it only saves once you complete a world, meaning that if you get through a few stages, or even make it to the boss and have to turn off Alien Escape for some reason, you have to start all the way back at the beginning which is pretty annoying. Adding continues that granted respawning lives and the ability to save your progress I feel would have made the game a little too easy, but it also would greatly reduce how repetitive Alien Escape is. 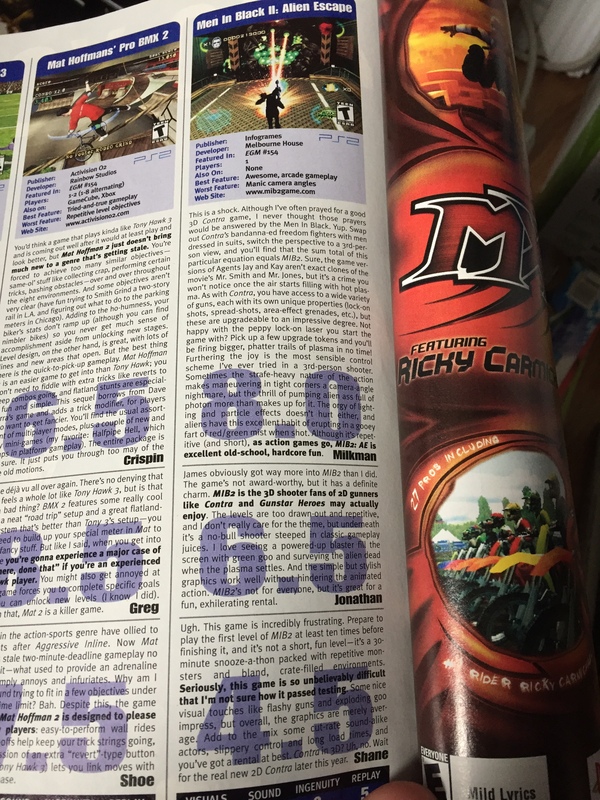 Men in Black II captures a lot of what made games like Contra great, but it also misses out on the aspects that made it excellent. In every world you’re doing the same thing, and it controls well, but you’re still doing the same thing over and over which makes you want to put the controller down and play in short bursts instead of large play sessions. The giant alien bosses and spaceships really stand out because of how different they are from the levels and have a retro feel with their life meter and flashing appearance when they take damage. There’s only five of those though, and they only show up after you’ve blasted what feels like your one millionth alien. This is a game in clear need to some mid-level set-pieces, vehicle segments or even mini-bosses to break up the moment-to-moment shooting action. 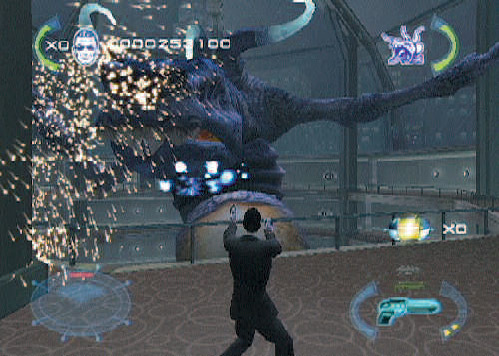 The levels showcased within Alien Escape are designed in such a way that is often counter intuitive to the type of game it is. Stages often have a lot of enclosed areas and tight corridors where it’s easy to get unfairly hit, caught up in scenery and cost you health, weapon power, and progress. The camera is also placed a little too close to your agent, which also makes it a little easy to run into walls or other scenery when you’re tying to avoid rushing enemies and bullets. The stages themselves are also fairly uninspired, made up of generic things like subway stations, city streets and docks with none of the flair that Crashdown had on the PSOne. Alien Escape is also fairly graphically interesting either with a lot off bland, uninteresting environments when clearly the PS2 was capable of doing so much more. There’s a decent amount of enemy variety, but you also get a lot of the same few types just with different color schemes as well. This is mixed in with a soundtrack that will make you want to play with the volume all the way down, which is what I had to do to get through this, turning it on briefly to listen to dialogue within cut-scenes. This is the first, and only, Men in Black game where there’s a difference in Agent’s J and K as they have their own unique weapons, which you think would add some replay value to change things up for a second go around or even have different perspectives through levels but the way in which you go about going through a level is the same no matter who you pick. Given that there’s two distinct MIB agents in this game and it’s so heavily inspired by twitch shooters, it’s also surprising that there isn’t an option to play cooperatively with a friend. A lot of the faults with how repetitive the finished product is could be more easily looked over if you could bring a friend along to shoot some aliens with, but this feature is sorely missing. Men in black II: Alien Escape has a lot of good things going for it like sound mechanics and a good overall transition of classic 2-D arcade shooting gameplay into the third-dimension. Had it perhaps had features like co-op as well as more interesting stages and level design, Alien Escape would be a lost classic, must-play game, but in the form that it exists in, it’s at best an okay game played in short bursts if you can manage to score it for cheap. This goes double if you were a fan of Contra and were disappointed by Konami’s attempt to translate that series into 3-D. If your idea of a shooter is one with cover or dual-stick controls or cover, consider this a pass unless you’re a fan of the source material.